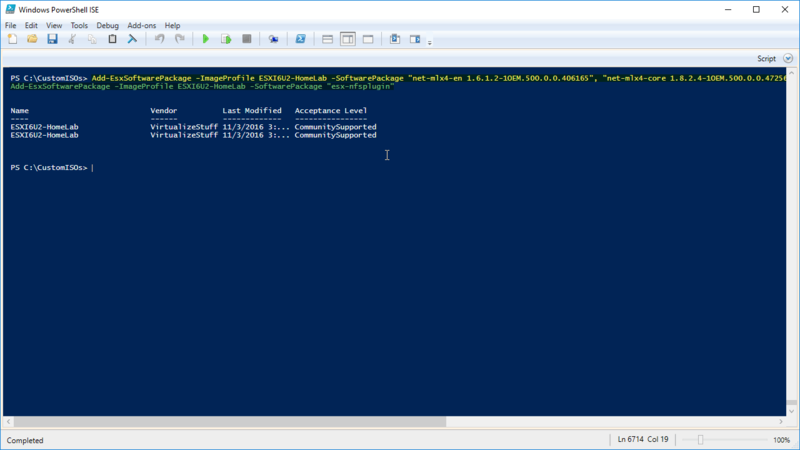 We need to download and install PowerCli which can be found here as this will provide the required PSSnapin (VMware.ImageBuilder). 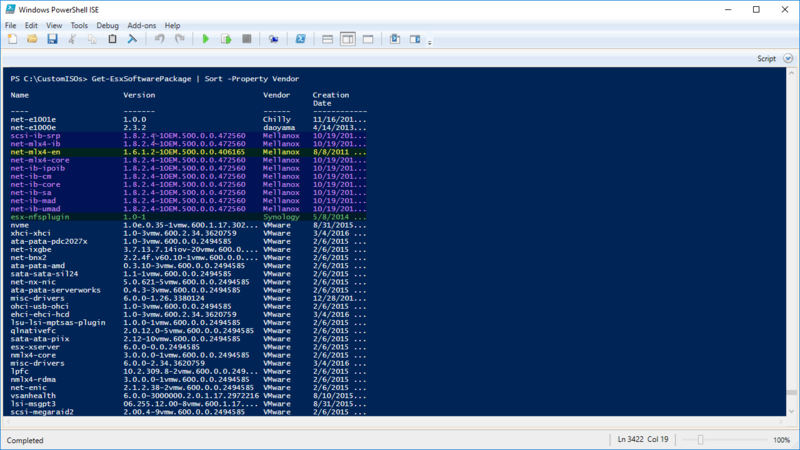 Next is to download the ESXi Offline Bundle clicking here and selecting Download Now. 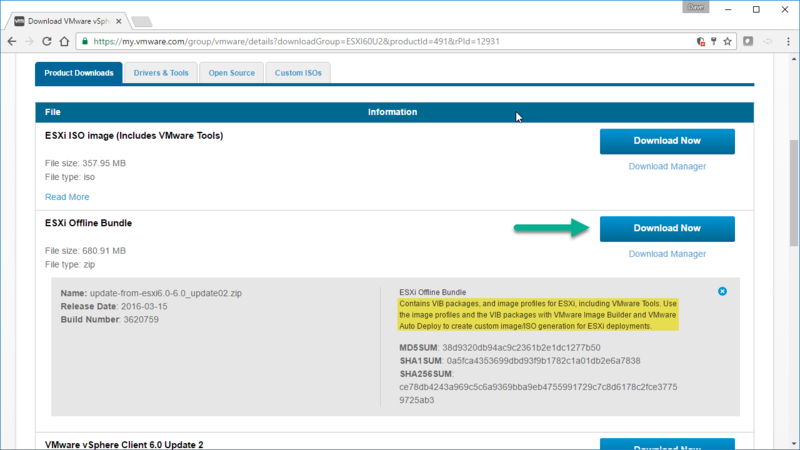 The ESXi Offline Bundle contains VIB packages, image profiles for ESXi and includes VMware Tools. 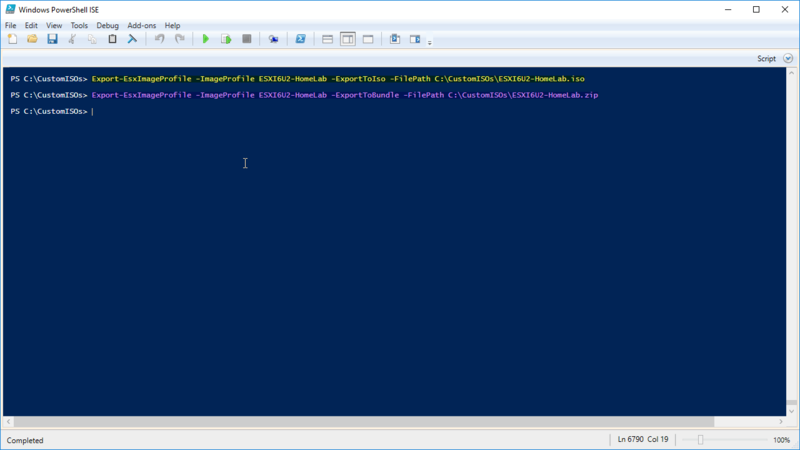 This can also be done in PowerCli but since I do a majority of my work in the PowerShell’s ISE we’ll use that. 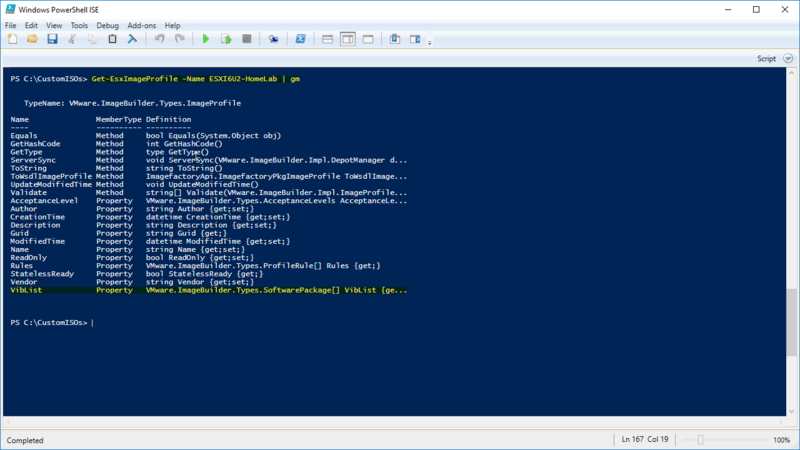 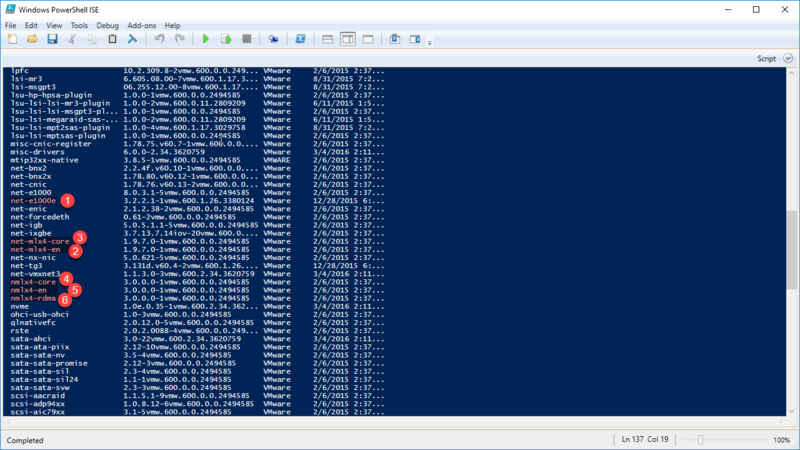 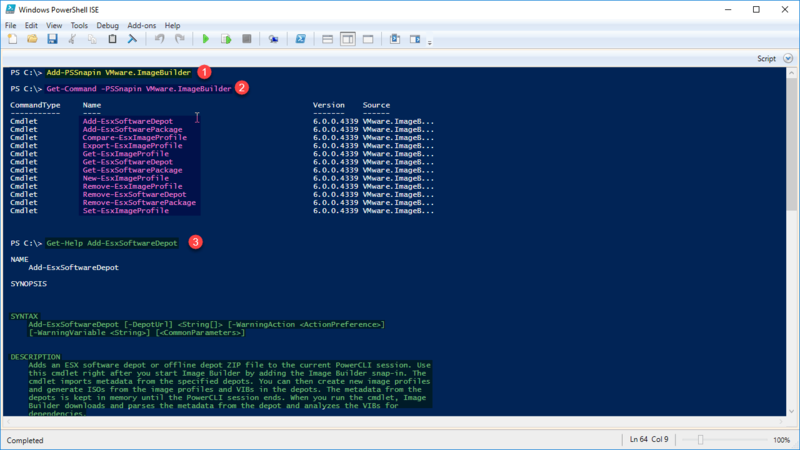 The Add-PSSnapin VMware.ImageBuilder command will load the Cmdlets from the VMware.ImageBuilder snapin into the current Powershell session. 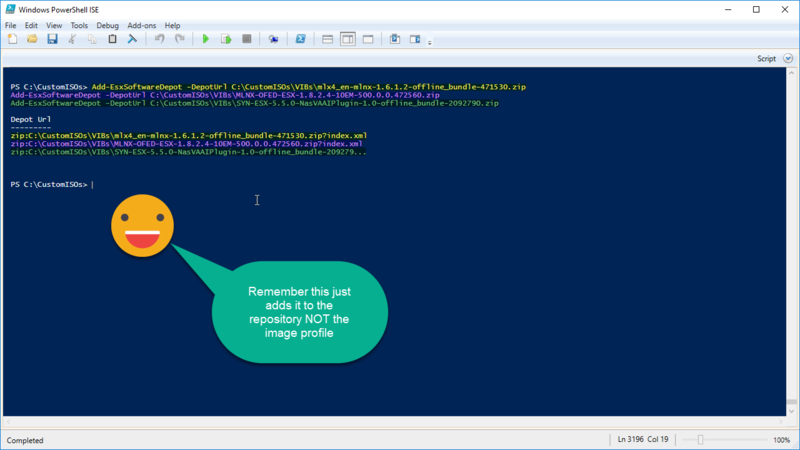 Lets list all VIB objects inside the Image Profile ESXI6U2-HomeLabbundle by running Get-EsxImageProfile -Name ESXI6U2-HomeLab | Select-Object -ExpandProperty Viblist | Sort-Object . 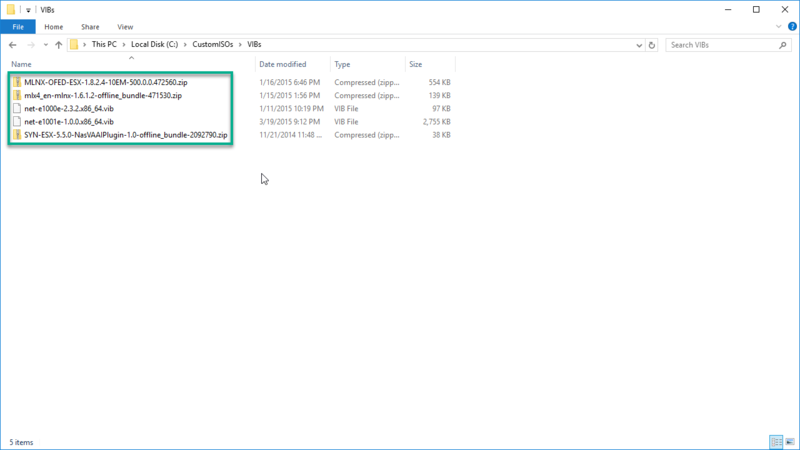 The VIBs we need to remove are highlighted in red. 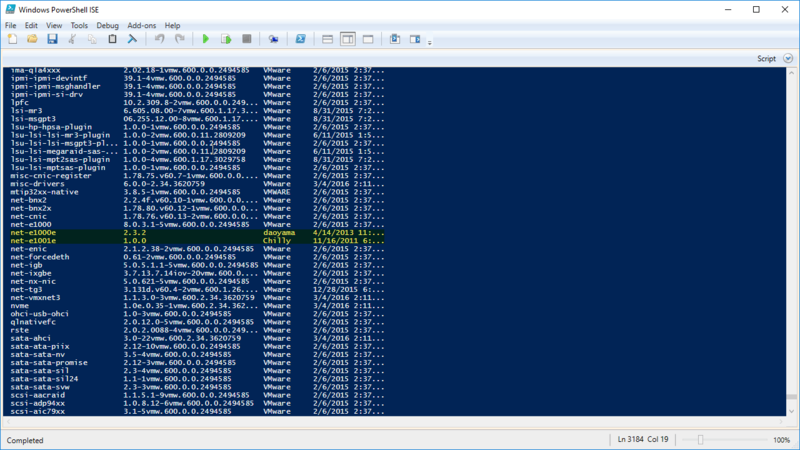 Note the order net-mlx4-en must be removed before net-mlx4-core because it has a dependency to net-mlx4-core. 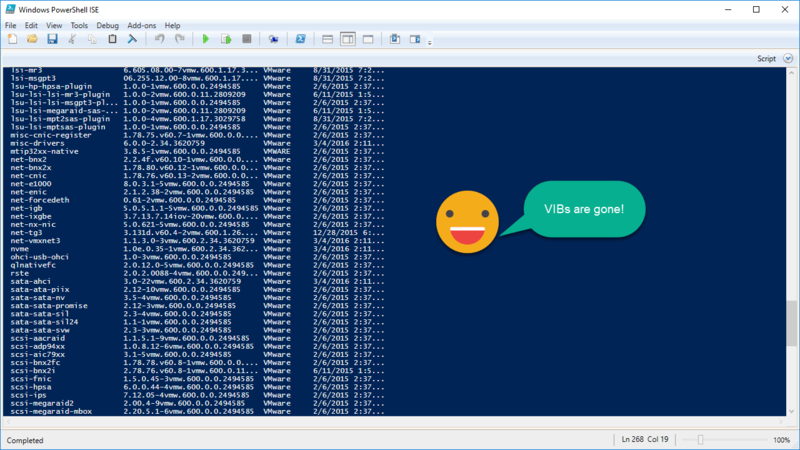 If we run Get-EsxSoftwarePackage | Sort notice how the VIBs are shown in the list of VIBs. The Get-EsxSoftwarePackage returns a list of VIBs from all the connected depots think of it as a repository. 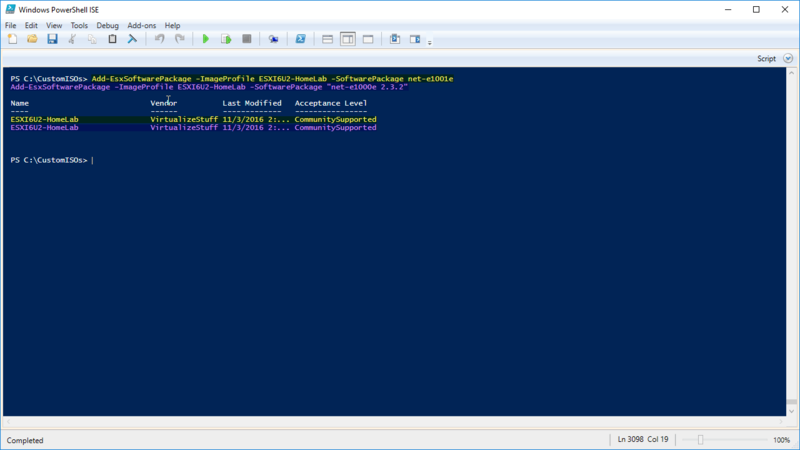 Add-EsxSoftwarePackage -ImageProfile ESXI6U2-HomeLab -SoftwarePackage net-e1001e Add-EsxSoftwarePackage -ImageProfile ESXI6U2-HomeLab -SoftwarePackage "net-e1000e 2.3.2"
Add-EsxSoftwarePackage -ImageProfile ESXI6U2-HomeLab -SoftwarePackage "net-e1000e 2.3.2"
If we run Get-EsxSoftwarePackage | Sort -Property Vendor We see it in the repository. 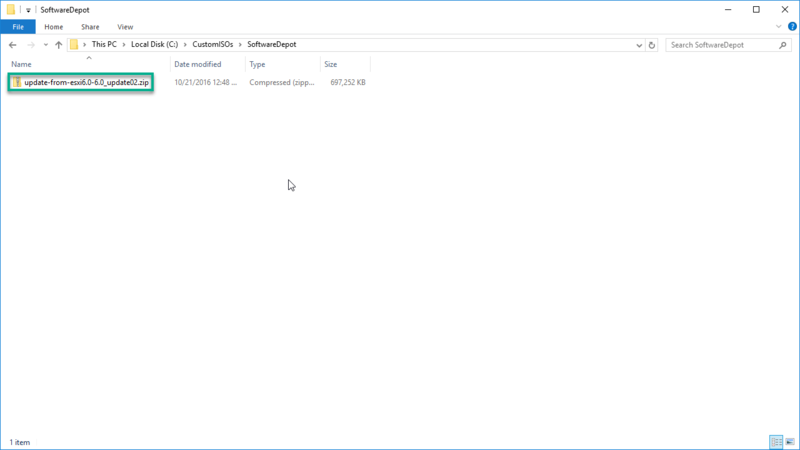 Add-EsxSoftwarePackage -ImageProfile ESXI6U2-HomeLab -SoftwarePackage "net-mlx4-en 1.6.1.2-1OEM.500.0.0.406165", "net-mlx4-core 1.8.2.4-1OEM.500.0.0.472560", net-ib-core, net-ib-mad, net-ib-sa, net-ib-cm, net-mlx4-ib, net-ib-umad, scsi-ib-srp, net-ib-ipoib Add-EsxSoftwarePackage -ImageProfile ESXI6U2-HomeLab -SoftwarePackage "esx-nfsplugin"
Add-EsxSoftwarePackage -ImageProfile ESXI6U2-HomeLab -SoftwarePackage "esx-nfsplugin"
Now that our ESXI6U2-HomeLab image profile is perfect its time to export it out as an ISO by running Export-EsxImageProfile -ImageProfile ESXI6U2-HomeLab -ExportToIso -FilePath C:\CustomISOs\ESXI6U2-HomeLab.iso. Now that we have a custom image with all required VIBs we are ready to deploy the image to our ESXi hosts. 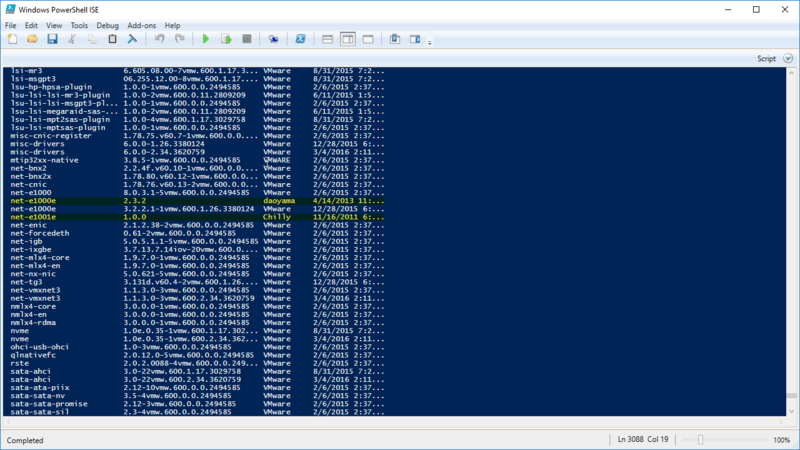 Stay tuned for the next post where we go through the installation of ESXi. 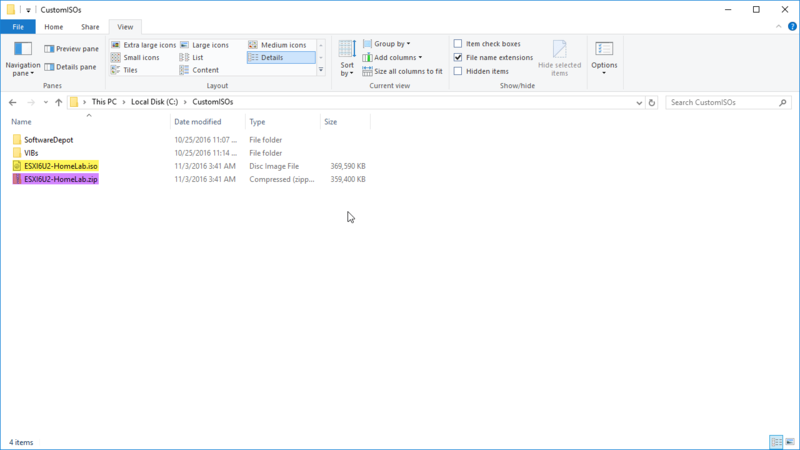 Thank you Jude glad you found the information useful.